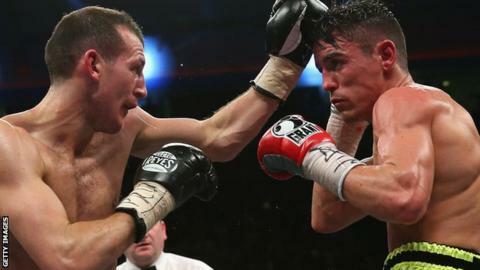 Derry Mathews wants to give injured Anthony Crolla a first shot at the WBA world lightweight title he intends to take off Richar Abril in March. Crolla, 28, was due to fight Cuban Abril this month, but was badly hurt when he tried to apprehend burglars in December, with Mathews replacing him. Liverpool-based Mathews, 31, stopped Manchester's Crolla in 2012 and the pair drew in 2013. "If it was up to me I will give Anthony Crolla my first defence," said Mathews. "I like the lad as a person, he's a good fighter and Liverpool v Manchester will be a massive fight. "I believe I deserved a shot before Anthony anyway, but now I have to take it one fight at a time and if I go and beat Abril, it opens doors for us to fight again." Crolla broke his ankle when chasing two burglars and fractured his skull when he was hit by a concrete slab during the altercation. It deprived the Manchester United fan a first world title shot and through promoter Frank Warren, Mathews - a Liverpool supporter - will now get his own first tilt at a world belt. The Echo Arena - where Mathews has fought three times before - is less than two miles from where he grew up and he will share the bill with fellow Liverpudlian Paul Butler, also boxing for a world title. Mathews has 36 wins and two draws from 47 fights during a 12-year professional career, which marks him out as one of the most experienced on the domestic scene. Abril, 32, has 19 wins from 23 contests but has only had two outings in the last two years and has never fought in the UK. "To be a Cuban fighter and make it to America you've got to be special as not many do that," said Mathews. "I want everyone to build him up to be the best fighter on the planet so when I do beat him I'll be the best fighter on the planet."